I’ve never even been to Café Grumpy, but Noah brought a few slices of their breads and pastries to the office one day and I was blown away by this savory banana bread. I searched for the recipe and found it on Greenpoint Gazette but the measurements were in grams which is really annoying, Brooklyn! It’s easy enough to convert using a recipe calculator or use a digital scale, but the cook in me still needs to feel if everything is right after the conversion. 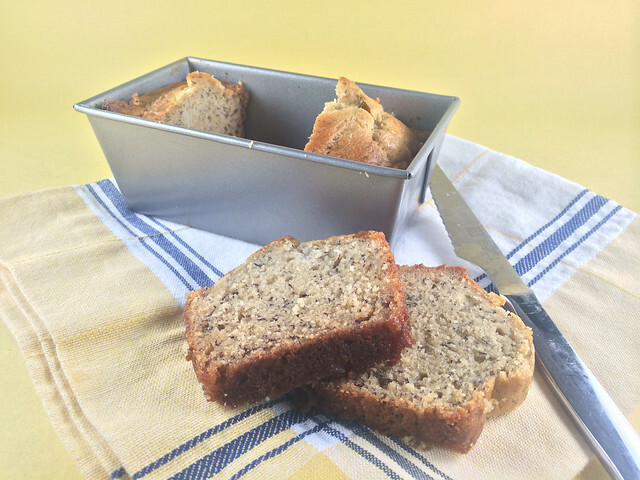 I found myself rounding off the converted measurements, and in the end I realized I could have just used my usual banana bread recipe and added the yogurt, the black pepper and cardamom to the batter. So much for science. I used a loaf pan for my version, but I had enough leftover batter to fill up a mini one. I lined the large pan with greased parchment paper to make it easy to separate the bread before serving. I always found that the larger loaves that I bake are more sticky. Sprinkle the top of your loaf with confectioner’s sugar if you want to be extra fancy. Update: I baked this again using a muffin tray and the ingredients filled 18 regular-sized holes. I baked them in the same temperature for the first 30 minutes, but brought it down to 275º for the remaining 10 minutes. 1. Heat oven to 325º and grease a loaf pan. Set aside. 2. In a medium bowl, combine flour, salt, baking soda, black pepper, and cardamom. Set aside. 3. In another medium bowl, mash ripe bananas with yogurt and vanilla until well-combined. Set aside. 4. Place butter along with both sugars into a mixer fitted with a paddle attachment. Cream. Slowly add eggs, scraping down the sides of the bowl in between pulses to ensure that all ingredients are well-incorporated. 5. Alternating between the dry ingredients and the banana and yogurt mix, add everything to the mixer using a medium setting so as not to over-mix. 6. Pour batter into the loaf pan and place on a baking sheet. Bake for 45-55 minutes or until a toothpick inserted in the middle comes out clean and the cake is golden. Remove from oven and let cool for at least 30 minutes before serving.